The pharmaceutical industry in India has been booming since the last years and the role of plastics has only been increasing. Plastics today plays a vital role in the packaging of the drugs or delivery devices such as inhalers, injectable devices etc. 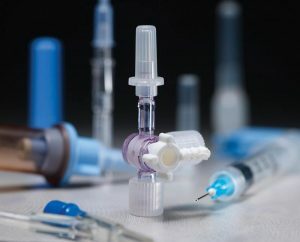 The medical device sector apart from disposables such as syringes, Blood Collection Tubes, Catheters etc is yet to full tap its potential in India and we are Unimark are fully geared to introduce the latest trends in the world of Medical Technology to all our clients. The requirements for quality and safety of medical parts are very high: in addition to tightness, strength and minimal generation of particles, process validation and process stability also are important factors in manufacturing. To ensure that everything is right from the start, we advise you in detail from the concept stage itself. We can offer the following solutions for your needs in the medical industry. Mould cavity monitoring systems by Priamus System Technologies AG, Switzerland for precise control of the injection moulding process. Mould temperature controllers suitable for use inside clean rooms by Tool-Temp AG, Switzerland. Medical tube extrusion lines from Labtech Engineering Co Ltd, Thailand. Application with Herrmann Ultraschalltechnik to weld medical devices that are water and dust proof.